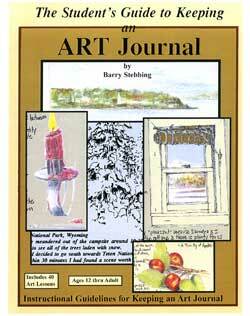 Barry Stebbing, artist/instructor, designed these easy-to-follow lessons with specific learning objectives. 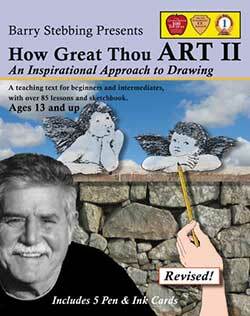 How Great Thou Art curriculum has quality Christian-based art programs for the budding artist. In God and the History of Art, your student will study art history from ancient Egypt to modern times. This four-year curriculum features an extensive survey of art history in chronological order with detailed discussions of the artists and the art periods with emphasis on Christian artists. 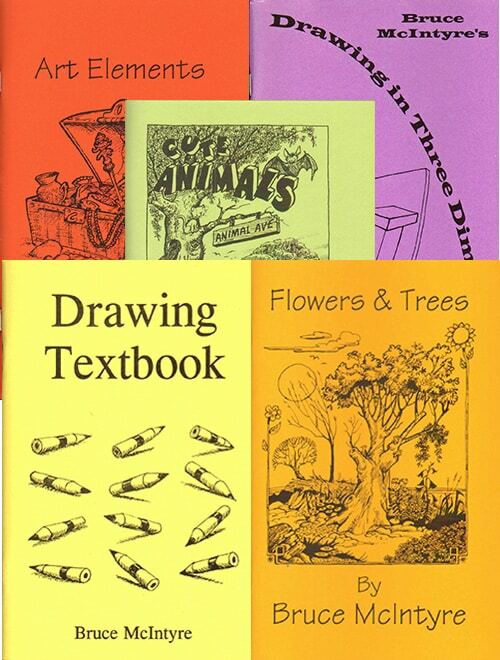 There are over 250 lessons teaching beginning drawing, painting, use of colored markers, perspective, color theory, etc. 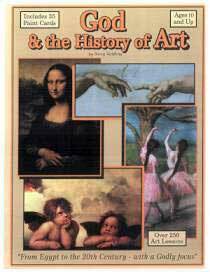 with 35 “paint cards” and 34 full-color postcard reproductions of works by Great Masters. 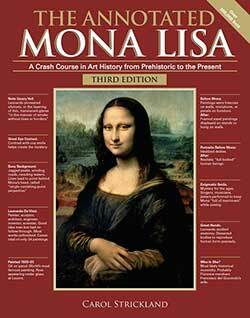 God and the History of Art is one of our best-selling programs for high school art history. View sample pages at the publisher’s website. 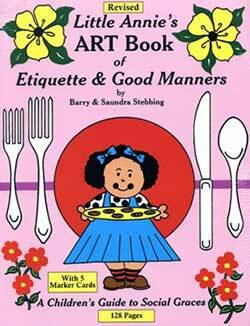 Little Annie’s Art Book of Etiquette and Good Manners teaches social graces with scripture and simple art assignments. This art book has over 45 lessons. Your student will need a set of crayons or colored pencils, washable markers, and a drawing pencil. Consumable or reproducible for in-home use. I Can Do All Things Book Set is now published by My Father’s World. The new 2nd edition has been edited and revised. The main changes are that is it no longer reproducible and the “Studying the Masters” section has been removed. 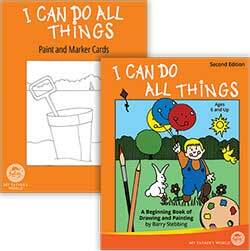 The Book Set includes one copy of the I can Do All Things Textbook and 38 Paint and Marker Cards. You need a Book Set for each additional child—The Book and Paint & Marker Cards are NOT reproducible. 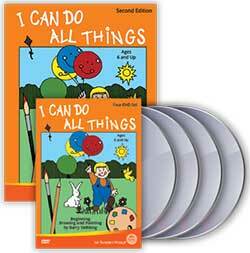 The I Can Do All Things Book will become your child’s portfolio. The Paint and Marker Cards are printed on heavy cardstock. You will need purchase additional art supplies such as colored pencils and colored markers—The list in included in the textbook. There are 26 Practice Lessons and 142 Art Lessons—Allows for about 2 lessons per week. 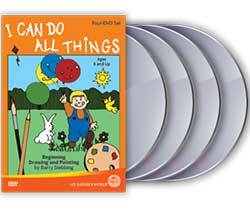 I Can Do All Things 4-DVD Set is now published by My Father’s World. The DVDs have been edited and revised to match the 2nd Edition book. The companion 4-DVD set teaches each lesson. It has over 6 hours of step-by-step instructions and demonstrations. Feed My Sheep is a three-year art curriculum which teaches the fundamentals of drawing and beginning painting, anatomy, perspective, art appreciation, portraits, etc. It is reproducible for home use. 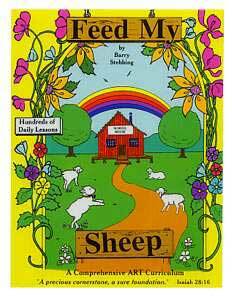 Feed My Sheep comes with 17 paint cards. 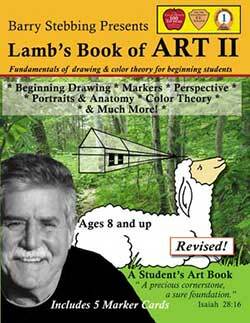 Lamb’s Book of Art I teaches a well-rounded foundation in art. Subjects include color theory, drawing, perspective, nature studies, anatomy, portraits, and more. Colored pencils are recommended for assignments. 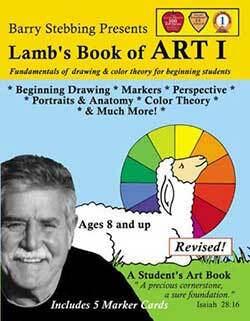 Lamb’s Book of Art II is a complimentary art text for Lamb’s Book of ART l.
Assignments can be done directly in the text. It doesn’t matter which book you start first. Colored pencils recommended for assignments in the Lamb’s Book of Art II. It is directed at ages 8 to 13. 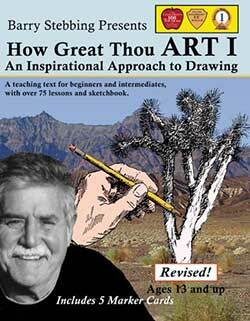 How Great Thou Art 1 teaches a strong foundation in art, learning the basics of drawing, mainly drawing from life. It includes inspirational quotes and scriptures included with daily lessons. This consumable program is for ages 12 to adult. How Great Thou Art 2 is the complimentary art text for How Great Thou Art 1. 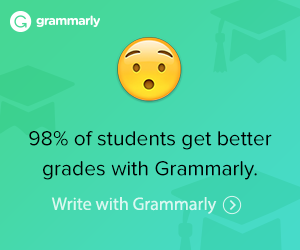 You can start with either text. It has similar lessons with introductions to lettering and calligraphy. 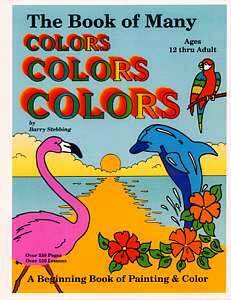 The Book of Many Colors includes 160 lessons with 250 pages and is considered a 3-year curriculum. Mediums studied are pastels, watercolors, oils, acrylics, colored markers, and colored pencils. 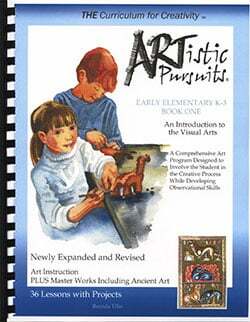 Barry Stebbing has constructed a series of thirty educational and enjoyable painting exercises. Each is on a sturdy 8″ x 11″ heavy index stock card ready for painting. The text comes with one set of paint cards. The Student’s Guide to Keeping an Art Journal will instill discipline and help develop creative thought processes. Journaling is an integral part of learning about the fine arts.